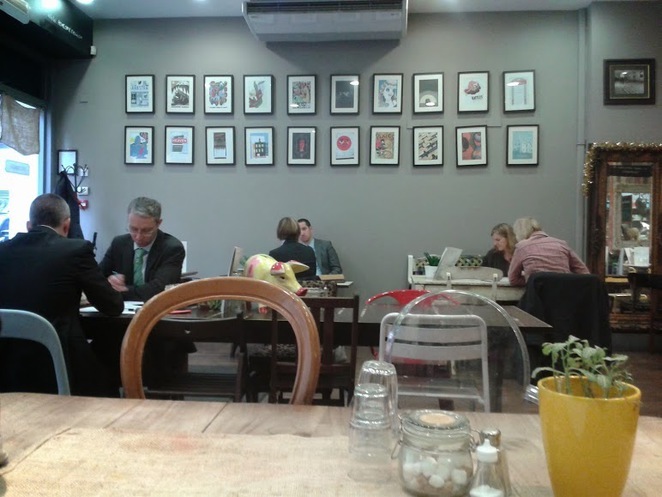 Cafés or delis are ten a penny in any city, with the vast number of chains taking over the high street so sometimes it's nice to discover a little independent gem that delivers somewhat like finding your own buried treasure. Located on the outskirts of Birmingham City Centre on one of the side streets, Church Street to be exact, nearby Pigeon Park and Birmingham Snow Hill, is this lovely quaint deli/café, Home Is Where. It is located amongst a coffee shop, a high end menswear shop and Hotel Du Vin near the Birmingham business district. It stands out and for all the right reasons. 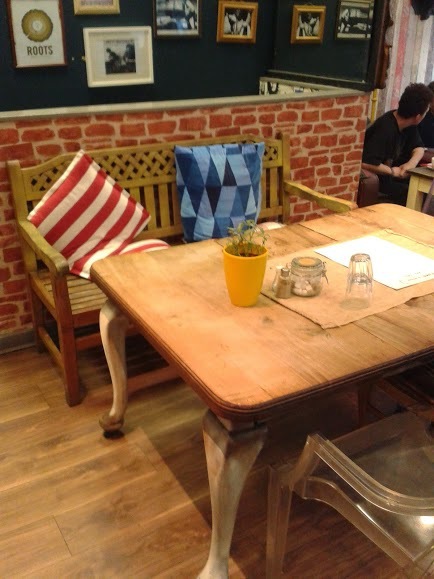 The place itself has a high ceiling which makes it look vast but still keeps to a cosy vibe. There is a random pig on the table and a lamb on the countertop which could be seen as insensitive if you're vegetarian but it seems to fit the rustic farm-like theme of the furnishings. The place is so inviting and chilled that it is the perfect place to get away from the hustle and bustle of Birmingham City Centre. It is understandable why it is called Home Is Where because it feels like home. If this was their aim then they succeed very well. The most interesting aspect is how there are no matching chairs; every single one is odd. Some might see this as weird but it adds to the character of the place and makes it a little bit more quirky and hipster. 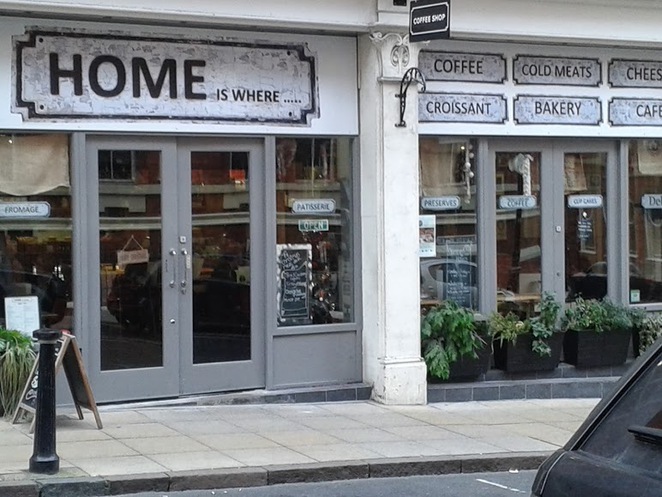 Because of its location, it has a whole host of differing customers, from men in suits having a meeting or busily using their laptops to students having a bite or mothers have a chinwag etc. There is no real demographic for this place, it seems to suit anyone and cater to all tastes and needs. They serve breakfast all day, have a vast array of teas and cold drinks, an organic sandwich range, and a tapas selection for the indecisive customer. 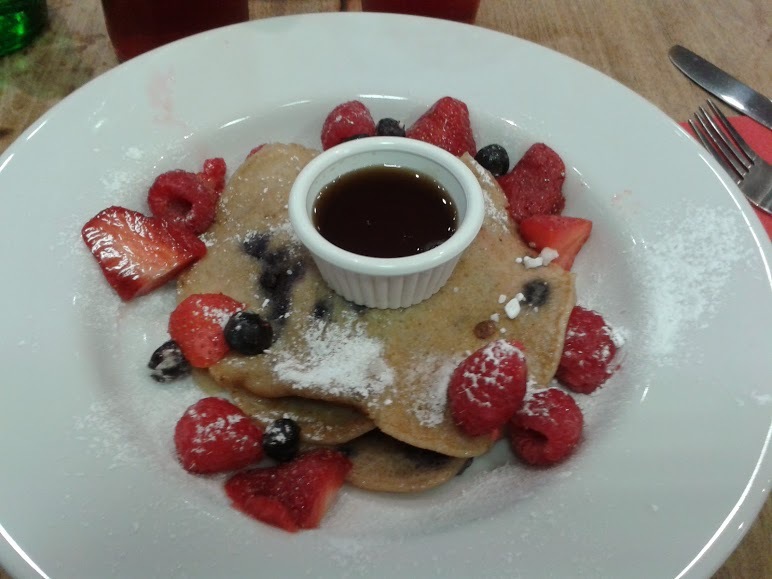 I chose to have the blueberry pancake stack with maple syrup, which was served with raspberries, strawberries and blueberries, which are my favourite of the berry family. It was really delicious and I was kind of tempted to lick the plate but refrained, thankfully. 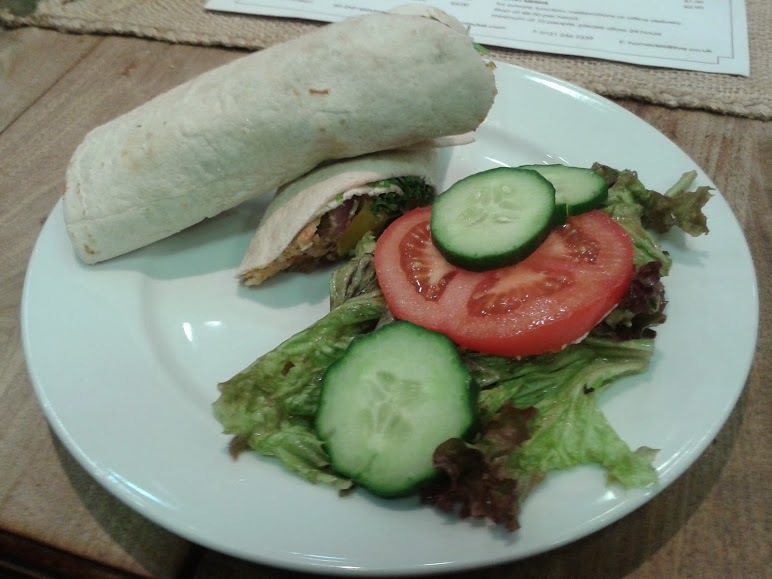 My companion, aka my mother, decided to go for the falafel, roasted Mediterranean vegetables, tomato and chilli hummus in a wrap form. It looked so delicious and was served with a chunky salad, with a tomato the size of my head. The falafel tasted homemade and you could see lentil pieces within it and there was the perfect amount of vegetable and hummus to compliment it. She thoroughly enjoyed it and wants to go back, which says it all really. They also cater for events and parties for competitive responsible prices, as seen in the image below. The staff are also nice; customer service is something that is temperamental in Birmingham and is the one thing that makes me want to go back to a place or to never return. The staff here seem to understand this and treat everyone well. I had a look on their site and under their recruitment tab they say they are looking for "enthusiastic, bubbly and smiley people who are passionate about food to join our fantastic team", which is exactly the kind of staff you get. It cost £12 altogether for the whole meal; this is the price that includes drinks. I thought this was responsible for the portion size and quality of the food. Have you visited this place or do you know a better place in Birmingham? The pancakes look gorgeous. I like that they have put the sauce in a dipping dish, so you can measure out how much you want.